Enchanting 2-bedroom luxury gîte in rural Gascony perfect for romantic breaks. 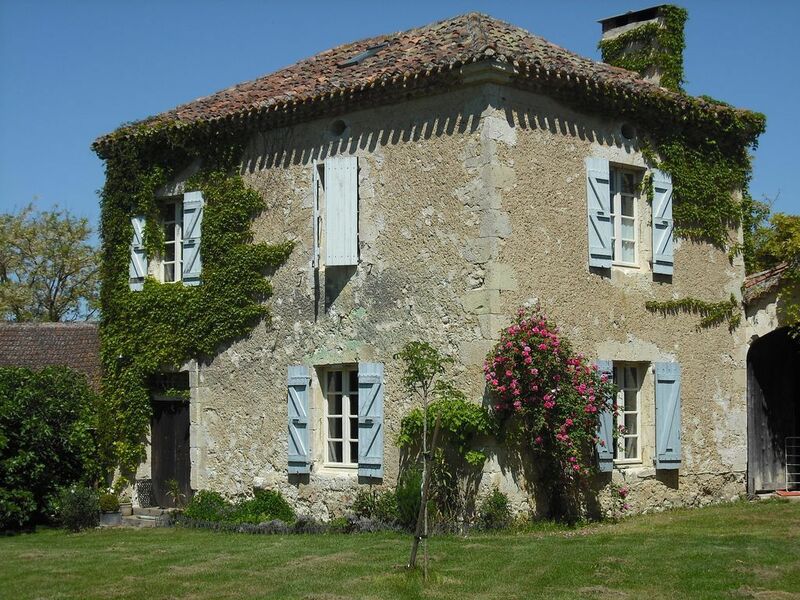 Beautiful, ivy-covered cottage, sleeping 2-5 in 2 french country-style bedrooms. Equipped and furnished to very high standards. Romantic, ensuite master bedroom with luxurious extra-wide bed and claw foot bathtub. 2nd bedroom under the eaves with half-bath and play area, perfect for children/teens. Comfortable lounge with DVD, TV and HIFI with large selection of books and games. Compact kitchen equipped with the avid cook in mind. Herbs and fruit trees grow throughout large, private property. Swimming pool, badminton, boules, bikes, giant trampoline, croquet, and 2 acre garden with many secluded lounging spots and tables to spend quite time. BBQ and poolside terrace. Perfect for cycling, walking, birdwatching or just relaxing and getting away from it all. Available throughout year, with cosy wood burning stove for low season rentals. Enchanting, fortified medieval villages, swimming lakes, wine and Armagnac domains and gourmet restaurants abound. Bilingual proprietor on site, or local host available to help with questions and needs. We searched for our home in Gascony for years, Yannick was born and raised in the nearby citadel of Lectoure and his family lives nearby. When we visited this property (built in 1821) even though it was February and raining, we loved the huge fireplace with cozy wood-burning stove, the 5-star bed linens and privacy. The property has so many features with stone buildings, gardens, the stunning views of the countryside across the pool... The nearness to wildlife brings harmony and quietude into focus while the teeming village of Castera Verduzan is a 7 minute drive away. Aside from the many logistical benefits mentioned, we fell in love with the ancient beauty of this old stone farmhouse and its magnificent sunsets in a secluded setting. Each day a different sky and stunning scene. Even when raining it is alive with beauty and magic. The original fireplace has the opening of wood-burning oven where people of the hamlet came to bake their bread. My favorite is the original 3-story staircase with gorgeous, worn steps. The huge wooden door still hangs and opens out onto a private park, yours to walk, play, or lounge. The bees hum, the birds thrive, the owls and osprey live high in the trees. Lavender and roses surrounding the house are there for your pleasure and enjoyment. If it is country, bucolic living you want, you've found your paradise. toilet, shower, Ground floor shower closet under staircase, includes toilet. Romantic en suite bathroom to master bedroom with window seat looking over garden and mature trees. Bathroom 2 is located on the ground floor. Attic room has wc and wash basin. Bucolic farmland with cows as nearest neighbors. Viewed from across the pool on next hilltop over! Comfy seating for 6 inside. Poolside dining with 6 chairs available. shared with the family when in residence and in use by renters. Laundry room, BBQ grill, firewood, floats for pool, lounging areas throughout garden. Nearby local lake-swimming parc. Fêtes throughout the Gers during the Summer in all of the villages. Many historic museums, abbayes, and villages in surrounding areas. Host can direct you to Armagnac houses and wineries in the region. This lovely farmhouse was the perfect escape for me from the bustle of my Paris adventure. The setting is idyllic, extremely private and quiet. It really was like my own private retreat amongst the sunflower fields, birds and scattered farms dotting the countryside. The house was comfortable and charming. I could take a stroll, lounge by the pool or bike around the area to appreciate the beauty.The entire property just invites one to relax and take in the surrounding vistas. There is a small village 10 minutes by car to get supplies or dine out. This is the ideal family or friend vacation home for those looking to get away and reconnect with loved ones. I will definitely be back again when the sunflowers are in full bloom to witness how glorious that must be! Dear Michelle, We are so glad our little 'peace' of Gascony could offer up a respite and be the healing salve you needed. Come again anytime. Sunflowers bloom from end of June to mid-August. July is their brilliant zenith! Stayed here for the whole of the month of September. Blessed with perfect weather we loved the beautiful well maintained pool, the excellent comfortable gite and the peace and tranquillity. Wonderful stars at night, a lovely view across the valley and many an hour spent watching the birds of prey circling above. This all within a 5 minute drive of Castera Verduzan ( try Le Florida restaurant for a great gourmet experience! ) with well stocked small supermarket, boulangerie and excellent butcher. Lots of historical villages to explore all within half an hour's drive. The perfect holiday all round! Thank you, Keith. We are delighted to know you enjoyed your month in the Gers at L’Ancienne Boulangerie. We hope to see you again soon! Nous avons passé un super séjour dans cette belle maison et avons pu découvrir la Gascogne de la plus belle des manières. L'accueil de Susan et de Yannick ont été des plus chaleureux à notre arrivée. Tout le confort était là dans cette superbe bâtisse. Rien à redire. Un magnifique endroit pour se reposer et se ressourcer. Merci Charles pour les bons mots. Nous avons adoré votre séjour dans notre petit coin de paradis! A rural, countryside setting unchanged for centuries. Hills and country roads to traverse while visiting ancient villages with bustling thriving communities. Markets, summer fêtes, cafes, brocantes and vide gruniers (town-wide sidewalk sales), music and the vibrant warmth of small-town living. local village sports a bakery, butcher, Sunday market, gourmet restaurant, and spa.